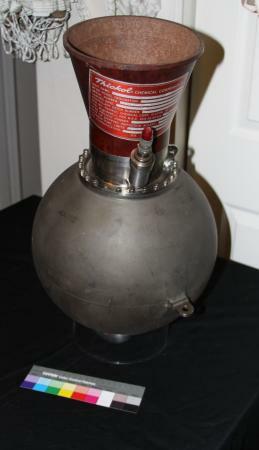 A TE-M-385 Star-13E Gemini Retro Rocket assembly manufactured by Thiokol Elkton Chemical Corp. in the first quarter of 1964 (the company was later known as Morton Thiokol and is currently a subdivision of ATK. It was built as a spare for the Gemini manned space program. This polysulfide propellant engine is a derivative of the Thiokol STAR-13 TE-M-485 orbit insertion motor. Four TE-M-385’s were housed in the Gemini spacecraft’s Retrograde Adapter Module and were provisioned to retard spacecraft orbital velocity for re-entry and to provide distance and velocity to clear the launch vehicle in the event of an abort during ascent from launch. The motors were symmetrically located about the longitudinal axis of the spacecraft and individually, optically aligned prior to mating the adapter to the re-entry module. Firing was initiated using the spacecraft cabin squib arm switches, which applied voltages that ignited the four retrofire rockets via open contacts of either the retro rocket automatic or manual fire relays (located on the Retro Fire Relay panel). The motor was individually rated for an ISP of 211.0 Seconds with a total impulse of 63.16 kNs. The motor includes a nozzle mounted to a 13 inch diameter propellant motor case comprised of titanium alloy. The nozzle assembly, a partially submerged, type, consists of the expansion cone, throat insert and nozzle bulkhead. The nozzle bulkhead is a machined titanium alloy, with 24 bolt holes to facilitate mounting to the motor case flange. The expansion cone is compression molded of vitreous silica phenolic resin and is threaded to the nozzle bulkhead. The throat insert is machined from high density graphite and is pressed into the nozzle bulkhead. The throat insert is insulated from the bulkhead by a plastic material to reduce heat transfer during motor operation and is designed to be recessed into the motor case to reduce nozzle assembly length (when mounted to the titanium propellant case). A rubber nozzle closure is sandwiched between the throat insert and nozzle bulkhead which incorporates a shear grove that permits ejection at a predetermined internal pressure level, or basically at motor ignition. A test adapter fitting is designed into the closure to permit pressure checking of the rocket motor. The Gemini capsule retrograde rocket motors were designed to function in two modes: Normal and Abort. In the normal mode of operation, the rocket motors were used to initiate Gemini spacecraft re-entry. They were fired sequentially at 5.5 second intervals, by hot gases from pyrotechnic igniter assemblies. The Retro rockets could also be salvo fired in conjunction with a launch abort scenario above 15,000 feet to separate the spacecraft from the Titan Launch vehicle.